We’d love your help. Let us know what’s wrong with this preview of The Legion of Shadow by Michael J. Ward. You have no memory of your past. With only a sword and a backpack to your name, you must discover your destiny in an unfamiliar world full of monsters and magic. As you guide your hero through this epic adventure, you will be choosing the danger that they face, the monsters that they fight and the treasures that they find. Every decision that you make will have an impact o You have no memory of your past. With only a sword and a backpack to your name, you must discover your destiny in an unfamiliar world full of monsters and magic. As you guide your hero through this epic adventure, you will be choosing the danger that they face, the monsters that they fight and the treasures that they find. Every decision that you make will have an impact on the story - and, ultimately, the fate of your hero. To ask other readers questions about The Legion of Shadow, please sign up. This book is a great idea, but for me it failed to rekindle the experiences of youth with the fighting fantasy books. Maybe I just don't have that inner geek in me any more? The books though are well written, the plot is tight and the characters engaging, if not totally lifelike. What does strike me is just how complex it is to write something like this, multiple interconnecting lines that must connect and support each other. The more I looked at the writing style the more impressed I was by it. If This book is a great idea, but for me it failed to rekindle the experiences of youth with the fighting fantasy books. If I had to mark the book for complexity and ability to reach that audience i would give the author a clear 5. But I'm marking based on my own experience and enjoyment, and I struggled to finish it, because its just not me any more. I do think though that many will love this book. and i do applaud Michael Ward for the book. 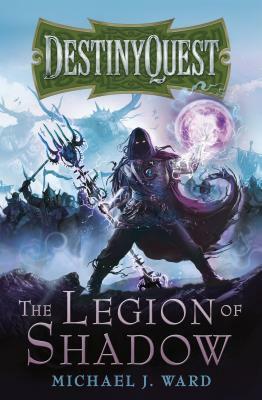 DestinyQuest: The Legion of Shadow takes its influence from two genres - the `choose your own adventure' book and the computer role-playing game. It uses an innovative map system to allow readers to experience exciting quests, battle fearsome monsters and discover valuable rewards. Through their adventures, the reader can customise their hero from a selection of 400 items and 80 special abilities, allowing them to take on ever-greater challenges as they seek to save the kingdom from the sinister Legion of Shadow. I had mixed feelings regarding this lengthy gamebook. Generally-speaking, it's like a traditional gamebook done in Fabled Lands style, with an obvious influence of CRPGs. It features an epic-length story where you get to choose which quest to do first, no perma-deaths, lots of gear, secret items, and even combat achievements. I enjoyed the story and the writing, but I really disliked how it integrated with the gamebook part of it. The main problem was pacing. Once the book enters act 2, there's a I had mixed feelings regarding this lengthy gamebook. Generally-speaking, it's like a traditional gamebook done in Fabled Lands style, with an obvious influence of CRPGs. It features an epic-length story where you get to choose which quest to do first, no perma-deaths, lots of gear, secret items, and even combat achievements. I enjoyed the story and the writing, but I really disliked how it integrated with the gamebook part of it. The main problem was pacing. Once the book enters act 2, there's actually a serious sense of urgency, yet the Fabled Lands structure basically means you are taking your own sweet time before going after the main quest (ala the majority of computer RPGs). It breaks immersion when you stray from the all-important time-sensitive quest to do lots of little side quests that mostly have nothing to do with the main quest - and you have to do these, just to get better "loot". But on the plus side, unlike Fabled Lands, DestinyQuest forces you to discard - you only have a limited number of slots, more akin to traditional gamebooks (and computer RPGs). The other part about pacing was how each act ended (there are 3 acts - the last act is basically a cliffhanger for book 2). The way the acts end were badly done, from a storytelling point of view. The second-to-last quest is basically your climactic ending - the "boss" fight, so to speak. You finish that, and... you start the last quest of the act - it ended up really anti-climactic, a serious dampener to what was a "high". It's like a really long epilogue that just drags on for no reason when all you want to do is to reach the next milestone. While the combat mechanics are easy enough, it gets really tedious once you get to the middle parts, to the point where I mostly couldn't be bothered anymore, especially since you just get to try again anyway. Way too much dice-rolling when you're facing multiple enemies, and multiple special abilities. And each time you get "loot", you'd likely have to look up and remind yourself what those abilities do (there's a lot of abilities). And just like computer games, these "item drops" can be rather silly (e.g. : body parts being used as "equipment"). It depends on what you're looking for when you read a gamebook I suppose. On the side, it's actually rather interesting that the gamebook adopts the video-game style of letting you pick a character class/role/job/profession/path (whatever you're familiar with), and you even get variants depending on your choices. It's nice, and I do think they offer different fighting styles, but ultimately the fights are not balanced - there is one class type and one stat/attribute that's simply better than the other two. Also, too bad the narrative doesn't really distinguish between the classes. For the book itself, unlike traditional gamebooks, there are zero illustrations (aside from the nicely-done coloured maps). Also, due to the book size, gamebook length, and large font, it's actually a bit unwieldy to play and read. But then again, despite the length, a lot of the paragraphs simply offer the illusion of choice. Many just branch off for one or two sections and then merge again - even when the choice is as significant as good intentions vs evil intentions (and that happened not just once!). In summary, the writing was pretty solid - it's a good story with personality, to the point where I actually like the few recurring NPCs. There's enough "meat" and "flavour" in the plot plus the world-building that would have made a very nice high fantasy story - without it needing to be a gamebook at all. On the gamebook side, I didn't really enjoy it much. In terms of gamebooks, DestinyQuest is a behemoth, both in its physical size and what the author is able to pack into the game's mechanics. The first thing that jumps out (after the initial shock of unpacking this tome) is its layout. Typical choose-your-own fare start you at #1 and send you on your merry way, not so here. After an engaging prologue, you, the reader, are sent to one of the book's three beautiful maps where you pick the next leg of your adventure. You are free to complete them in In terms of gamebooks, DestinyQuest is a behemoth, both in its physical size and what the author is able to pack into the game's mechanics. The first thing that jumps out (after the initial shock of unpacking this tome) is its layout. Typical choose-your-own fare start you at #1 and send you on your merry way, not so here. After an engaging prologue, you, the reader, are sent to one of the book's three beautiful maps where you pick the next leg of your adventure. You are free to complete them in any order or skip sections altogether (not that you'd want to, missing out on the variety of stories and items will only do you a disservice). Great concept will be fun to undertake the sequels. The story was a bit slow at times to make room for game play. The storyline was Ok but I don't really like books in which you choose what the hero does. If you like those books and book in which you kind of play a game too, you might like this.